As we mentioned before, the no!no! hair removal device is on sale at Sephora for $175, and now they’ve sweetened the deal – if you buy a Pink no!no! and use code NONO at checkout, they will throw in 2 additional buffers and five blades (2 long and 3 short) – that’s an additional $28 worth of products for free! If you have any interest in the no!no!, this is a great deal. Thanks to Freebieville for the heads up! Love the warm, blissful feeling of the paraffin wax dip before your mani-pedi? Get it at home with an at home Paraffin Spa . 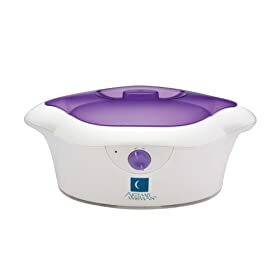 Just plug it in and let it warm up until the wax is melted, and then dip your hands (or feet) in 5-10 times to get a nice thick coat of wax, and then sit back and relax – it feels amazing and makes your hands soooo smooth. Try this one from Artemis that comes with a shea butter wax. Find it at Amazon.com for $39.99. I’d generally prefer that a trained spa person tend to my cuticles, but it’s definitely something I can do myself. Try these at-home tips (no pun intended) to get great looking cuticle beds without the manicure cost. Cuticle Soak: Heat up some water (warm, but not hot) and pour it into a nail soak. You might want to try Gena Manicure Cups – they are disposable and 25 come to a package, so you don’t have to worry about cleaning it out. I actually found the most comfortable container for my hand was the bowl from a Betty Crocker Warm Delight Mini Brownies – and you get a brownie out of the deal (excellent if you are used to Bliss World manicures with their piles of brownies available during your treatments). Once you have your warm water, add some oil to moisturize and soften your cuticles. Regular olive oil works great, or you can get creative. Jojoba oil is great, apricot oil is a classic, and Sweet Almond Oil smells amazing (and is an amazing moisturizer). With any of these, make it even more therapeutic by popping open a Vitamin E capsule in the water. You can even use it on it’s own. A little goes a long way with any of the oils, you can always add more if you think you need it later. Once you have your preferred oil medley, swish the water around and slip your fingers in for about 5-10 minutes and relax. And enjoy your brownie with your other hand. Moisturize: Of course we’ve all heard we should moisturize our hands every time we wash them (I’m a delinquent on that front). But after your nail soak is especially important to moisturize. It’s kind of like when you get out of the bath or shower – you may have used a moisturizing body wash, but your hands still need a slather of moisture after, or else your cuticles may end up drier than before. So after your delightfully relaxing nail soak, keep your cuticles soft and pliable with a moisturizer. A good cream moisturizer is best – everybody has their favorite. If you want the best looking cuticles ever, dab on and rub into your cuticles and nail beds some Liz Earle Naturally Active Skincare Superskin Moisturizer. I first tried this when I was on vacation a few weeks ago and forgot my hand moisturizer – my nails went from pretty gross looking to radiantly healthy in no time flat. Properly handle hangnails: You shouldn’t hack at your cuticle bed, but nipping off a hangnail is OK. But make sure you have the right tool for the job – using the nail clipper that you use to trim your nails isn’t the most sanitary. Invest in a good Cuticle Nipper – the one from Sephora is excellent – even a butterfingers like me can use it easily. Give your hands an overnight treat:For everyday cuticle and hand maintenance, use Bliss Glamour Gloves overnight or while watching TV. The gloves have a gel lining that contains olive oil, grapeseed oil (also a good oil for your nail soak – forgot about that one! ), and Vitamin E. Just slip them on and let them do the work. 20 minutes will give you a nice moisturizing treatment, overnight will give you an almost miracle. And a winter bonus – they keep you nice and warm, so you can turn down the thermostat down a couple of degrees overnight and still be nice and warm. See? Two money saving tips with one product! Stay tuned next week for more at-home manicure how-tos! Cutting out spa treatments may seem like a silly thing to feel deprived over in bad economic times, but there are things that are simply easier to have someone else do (for me, manicures), but that I can do myself. Other things may mess with your head a bit if you can’t fit a treatment into your budget. For instance, do you include a treatment in your facial that makes your skin glow and keeps you looking perpetually peppy? If you have to cut out that kind of service, you may find yourself catching a glimpse of yourself in the mirror at some point and wonder why you suddenly look tired and, well, blah. That’s the kind of treatment that is worth it to keep up at home if you find it hard to fit a spa visit into the budget – if you feel like you have lost your “pep” everytime you look in the mirror, you may end up feeling that way the rest of the time too. Liz Earle Naturally Active Skincare Brightening Treatment Mask: I waxed on about how much I love this stuff in my product review recently. It works fast (two minutes or less), and does an amazing job. It made my skin look like I had the luxury of a perfect night’s sleep and endless energy. It naturally imparts what you try to make your skin look like with blush – pretty amazing. Find Liz Earle’s Brightening Treatment Mask at LizEarle.com for $24. Bliss World Triple Oxygen Instant Energizing Mask: If you are a bit of a mad scientist at heart, you’ll love the way Triple Oxygen Instant Energizing Mask goes from a peach-colored gel to a massive, bubbling foam, crackling and popping for five minutes as it adds oxygen to your skin. If you aren’t a mad scientist, you’ll just love the results: your skin gets less oxygen from your blood as you get older, and this mask gives your skin a little oxygen kick. Which translates to rosy, radiant skin. Find bliss triple oxygen instant energizing facial mask at blissworld.com for $52. And for the record, I’m in the Mad Scientist catagory when it comes to skin care. La Mer Radiant Infusion: This quick and effective brightening treatment goes to work on dull skin and leaves you with tight pores, bright skin, and a fresh feeling. Swipe some over your face on a cotton pad and your skin will have an instant boost of brighteness. It contains antioxidants and lime to counteract sun damage and prevent further discolaration as well. And it feels great on! Find it at Saks.com . Stay Hydrated: Yeah, we all know we should be drinking more water. Does your favorite spa have a special water/tea/”infusion”? Ask if they sell it so you can enjoy it at home while you are enjoying your home spa routine, and try to guzzle more water the rest of the time as well. A few cucumber slices go a long way to make tap water seem more crisp – if you are making yourself a salad, set a couple aside, put them in a container filled with water in your fridge for a few hours, and you will have tasty, crisp water, which will hopefully get you to drink more. I’m fortunate in that the tap water where I live is tasty all on it’s own, but I still need a little motivation every once in awhile – keep a water flavoring powder in the house or add a splash of juice if you need to. If you keep up with it, you can go from dull skin to radiant skin with an inner glow. Mac Strobe Cream: Hey, sometimes you need to fake bright and luminous skin – and the makeup artist at the spa would tell you that same as she slathered a great cream like MAC Strobe Cream . Not only does it give you an instant luminous glow (you will look perpetually happy), it gets to work on your skin to make it naturally bright via green tea and anti-oxidants aimed at adding brightness and clarity to your skin. Find it at Nordstrom.com for $29.50. Don’t you marvel at how soft your face is after your skin is professionally exfoliated? If you would like to still marvel at your soft skin without the wonder of seeing how much your spent at the spa when you billing statement comes in, read on. Liz Earle is a great line from England – check out my rave review of their Brightening Treatment Mask – and within their line are a couple of excellent exfoliating products. First off is their Gentle Face Exfoliator. It gently buffs away lifeless skin with jojoba beads. Apart from doing a great job exfoliating, jojoba drives other ingredients deeper into the skin (it is known as a “transporter” oil) – if you have ever tried ISH haircare product you know how great it is for getting active ingredients further than they would sink in on their own. The Liz Earle website states that this is a great exfoliator for every skin type except sensitive skin. If your skin is sensitive, I’d recommend their Liz Earle Cleanse & Polish Hot Cloth Cleanser to gently rid your skin of dull skin – and be sure to use the included muslin cloth to get a more thorough exfoliation. I’ve had several days in the past couple of weeks that my skin has gotten seriously wind-burned outside and I can’t tolerate a more intense exfoliation, and the Cleanse and Polish Cleanser has done a great job of both soothing and gently exfoliating. Even if you are still hitting the spa for facials, I still recommend this for everyday. Find both products at LizEarle.com. I will soon be doing a product review of Avon’s ANEW REJUVENATE Flash Facial , but in the meantime, let me extoll the amazing way it smooths your skin better than any facial ever could. Thanks to the “Exfo-Smoothing Complex”, you will think that you stepped into a time machine and have your childhood skin back – smooth, radiant, lineless, poreless, etc. Seriously, this stuff is freaky good, and works fast. Get it. You will thank me. Find it at Avon.com for $48. For a truly luxurious home exfoliating facial, try La Mer’s The Refining Facial . It exfoliates in two way: first acidic sea mud loosens and lifts up dead cells, and then a mixture of diamond (yes, diamond) powder and refined quartz crystals brush them off your skin. It works great and feels great – I went from dull skin to getting a gasp from my mother about how vibrant my skin looked in one use. Use it about once a week and slowly massage it in circles and enjoy – you are rubbing diamonds all over your face! Find it at Saks.com . Avon ANEW CLINICAL Advanced Retexturizing Peel will knock your socks off – these little pads gently yet powerfully sack dead skin and discoloration. Avon compares this product to a professional 35% glycolic peel, and while I’ve never had a professional peel, I’d be thrilled if I came out of the spa with skin like this. You skin glows, blackheads are banished, and you can’t stop touching your skin because it is sooooo soft. When I keep up with using these pads on a regular basis, I get constant compliments on my skin. I follow up with a moisturizer to get my skin even softer. It is very impressive to get this kind of result without irritation or redness. Find it at Avon.com for $25 for 30 pads. Neutrogena Pore Refining Cleanser is an amazing cleanser for not only clearing out your pores, but also washing away dead skin cells, leaving you with glowing skin. If you have sensitive skin, try it every other day, if you don’t have sensitive skin, you can use it daily. It contains both Alpha and Beta Hydroxy Formula and “microbeads” that give the cleanser some texture in order to exfoliate and deliver the agents to the new skin. It’s a really great product at a great price – get it for $7.99 at drugstore.com . Juice Beauty is a great line of organic products that work fantastically. Although they have a separate exfoliating cleanser, I really like their Juice Beauty Green Apple Collection Cleansing Gel for a gentle daily exfoliation. It also contains a hydroxy-acid complex derived from apple and lemon juice to wick away the dead cells that make your skin look kind blah, and it’s not tested on animals, so you can feel good about using this effective organic cleanser. And you just need a little each use (a whole pump would probably cover your whole body), so it will last you for a good long time. Find it at drugstore.com for $26. Remember, you skin doesn’t need heavy exfoliation every day – that’s a recipe for raw skin. And don’t forget that washing your face with a plush, soft wash cloth gently exfoliates some dead cells and you can use it everyday – just don’t scrub too hard! While you may miss the plinky-plunkey music and cucumber water at the spa, these products really compete with a professional exfoliation, at a fraction of the cost. Is your skin missing the glowing look it gets after a facial? Stay tuned for our next Spa Economy feature on Brightening Treatments.